You’ve scoured the internet for travel destinations, successfully booked your vacation, and purchased of an obscene amount gear for traveling with your baby. As your departure date looms ever nearer, apprehension mounts as you contemplate a flight with your new little bundle of joy. Fear not. Whether this is your first trip or you’ve already got several baby travel adventures under your belt, we’ve collected some tips to make your travels relaxing and enjoyable. Flying with Baby: Tip #1 – Choose your seats wisely. A nifty little website called Seatguru.com allows you to “view” your seat. Simply choose your airline and aircraft body type from the drop-down menu and the Seatmap Key will give you the pros and cons for each seat on the flight. The most common aircraft body type in the continental US has three seats on either side of the aircraft. When traveling in a party of 2 or 4, our favorite trick is to book the window and aisle in the 2nd to the last row (the very last row doesn’t allow seats to recline). The front of the plane generally fills first, and middle seats fill last. So there is a good chance you will have the row to yourself. If the flight is full, the person in the middle will gladly trade to allow you to sit next to your child or spouse. Flying with Baby: Tip #2 – Pack light. Anxiety causes many new parents to pack for every random circumstance. The extra clutter not only makes it difficult to find the things you really need, it’s also expensive. Read “Top 5 Tips to Lighten Your Load“. Flying with Baby: Tip #3 – Be strategic in assembling your carry-on. A carry-on is your lifeline for the duration of the flight. Your carry-on should either have lots of exterior pockets or one large compartment with lots of modules. Each module is a self-contained unit that has a theme. You might consider having modules for diapering, feeding, clothing, medical supplies and entertainment. Important items like passports, money and airline tickets should be kept separately in your purse to prevent damage in the event of a bottle leak. For more detailed information about carry-ons, read “Contents of the Perfect Carry-On”. You will also want to become familiar with FAA restrictions related to “Bringing Liquids on the Airplane”. Flying with Baby: Tip #4 – Keep ‘em healthy. The most common worry for parents traveling with a young child is what to do if their little one has ear problems. Keeping your kids healthy prior to flying is an important step in avoiding ear problems. Since air travel is amazingly dehydrating, you will want to encourage your child to drink plenty of fluids. If your child is prone to congestion, you will benefit from reading the article “Avoid Ear Problems on Airplanes”. Many parents are concerned about their child getting sick from germs floating around in an enclosed environment. Since the plane’s air filtration system removes airborne pathogens, the true concern should be germs on surfaces. Using an antibacterial wipe to clean hands, arm rests, tray tables, and bathroom surfaces will go a long way to preventing the transfer of virus and bacteria. Flying with Baby: Tip #5 – Keep ‘em happy. This isn’t as tough as you’d think. 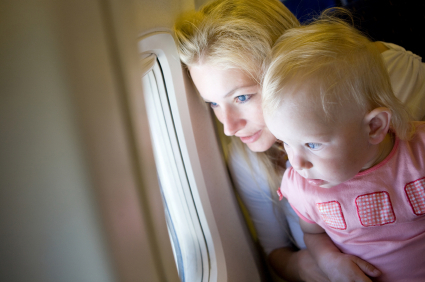 When flying with a baby, your little one will bask in the undivided attention they’ll be getting from you. In this environment, everything is new. From shiny pretzel bags to airsickness bags, magazines to plastic cups, a fresh toy is just a short grab away. For more sophisticated options for entertaining your little one, check the articles “Top Ten Baby Travel Tips” and “Entertaining Babies and Toddlers on Airplanes”. These are some great tips for travelling with little ones! Another suggestion is to have all your baby’s essentials;, milk, nappies, food etc delivered directly to your destination and waiting for you on arrival. No excess baggage charges no hunting for baby products in your resort, everything your baby needs just waiting for you. Please take a look at our company The Little Concierge Company http://www.thelittleconcierge.co.uk, we can look after all of this for you. the same topics discussed in this article? I’d really love to be a part of community where I can get opinions from other knowledgeable people that share the same interest. If you have any recommendations, please let me know. Bless you! Thank you for your comments. I found babycenter.com to be very useful. There are a lot of people using that site so a large pool of knowledge to draw from. I am bringing my baby to Singapore with me, this can really help me out!